Crowds assembled in front of the Taal Basilica during the American colonial era. Image source: Luther Parker Collection. Colorized courtesy of Algorithmia. From the so-called historical data on the town of Taal in Batangas1, we get these old traditions pertaining to courtship, marriage and birth. The “historical data” pertains to documents required of all Department of Education districts around the country by the administration of then-President Elpidio Quirino to reconstruct local histories after destruction brought on by World War II. 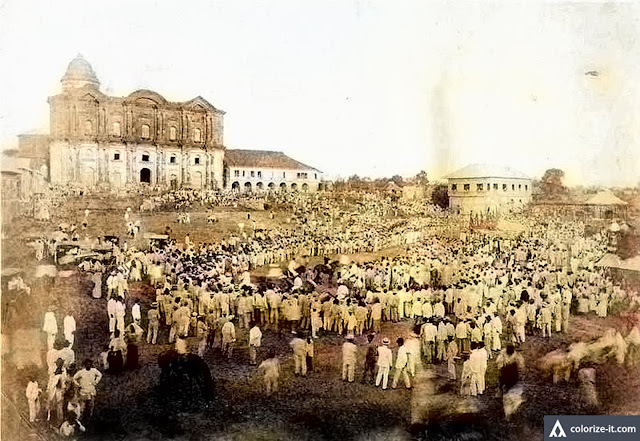 Although these beliefs were documented as they were practiced in the town of Taal, they were echoed not just in other historical data for other towns of the province as well as in earlier written ethnographic papers that belong to the Henry Otley-Beyer Collection of the National Library of the Philippines. In other words, these traditions were also practiced elsewhere. Unlike in the present day, courtship in Taal – and likely elsewhere in the province – was less an affair between two individuals but more one between two families. When a young man’s parents felt they had found a suitable bride for their son, they tried to coax him into visiting her home every afternoon. He was not allowed to go upstairs, however; and instead started helping with chores like “pounding the rice, gathering fuel2,” fetching water from the well and other mundane household tasks. The young man was expected to do this for all of two years. After this period of rendering service, if the parents of the young woman found the young man to satisfaction, they asked him to bring his parents with him for a conference. When they came, the man’s parents “thoroughly examined3” the prospective bride while her parents did exactly the same with him. If both sets of parents found the young man and woman to satisfaction, a “dowry4,” called “bigay-kaya” in Tagalog, was agreed upon. Once agreed upon, the man’s parents gave bundles of firewood to be distributed among the woman’s relatives. The biggest bundle was reserved for the woman’s family, which was kept until it could be given when one of her brothers started courting another woman. The young man and women then went to see a priest who would then try to determine their state of religiosity. If one or both of them did not know the prayers (presumably, of the Catholic Church), then they were instructed by the priest. Their names were called out in church three times, presumably to inform the faithful and determine if there would be objections. These accomplished, the man’s parents sent a boy and a girl to render service to the woman’s household. Festivities followed the wedding ceremony. After the meal, a mat would be spread at the center of the living room; and on this the newly-wedded couple would dance. While they did, money was thrown at them. Each person who threw money was expected to shout out loud how much the money was. Afterwards, the man picked up all the money thrown and gave it to his new bride. It was only then that the amount collected was revealed to the parents of the man, who in turn gave advice to the newly-wed couple how best to make use of it. A couple’s first child was always expected to be delivered at the wife’s parents’ home. All the materials that were used during childbirth, along with the placenta, were thoroughly washed. The placenta was then placed in a dipper (tabo in Tagalog). If the newborn was a boy, the placenta was buried with a letter, a “cartilla” (a small card) and a pencil. If the newborn was a girl, it was buried with a needle, thread and a piece of cloth. It was the belief that doing so would make the baby a “talented student when he or she” grew up. 1 “Historical Data Poblacion Taal,” online at the National Library of the Philippines Digital Collections. 2 “Fuel” in this context meant firewood. 3 We assume that the “thorough examination” was in a behavioral sense and suitability to marry. 4 Many of these “historical data” and even those documents belonging to the Henry Otley-Beyer Collection erroneously referred to property being paid by the man’s parents to those of the woman as “dowry.” The correct term was actually “bride price” or “bride service” because the dowry was the opposite, i.e. property transferred by the WOMAN’s family to the man.